Do you spend hours waiting for your food to be done? Do you have food that you wish you could store for a long period of time without having it go bad? Do you want to save time and money when it comes to cooking? Pressure canners can do that and much more. If you’re looking for a kitchen addition that’ll take it to the next level, pressure canners are what you’re looking for. You might also be interested in our articles about the best electric can opener and the best panini presses. The way pressure canners work is that they simply increase the temperature above the water’s boiling point to reach a temperature of 250 degree Fahrenheit. It does so by increasing pressure inside the pot, which leads to your precious food being cooked about 70% faster than usual. In addition to that, it gives you the ability to can low-acid food in jars in order for you to preserve them for long periods of time. By saving that much cooking time, you’ll save lots of money by lowering your electricity and gas bills, so a pressure a canner is kind of an investment that pays for itself. Whether you’re a professional chef, brand new to cooking or just a person who wants to store some seasonal food, a pressure canner is definitely a worthy addition to your kitchen’s arsenal of cooking equipment. Pressure canners can be a bit complicated though, when you look at them for the first time. They might even strike you as strange, metal containers with weird gauges on top of them. Despite looking similar to each other, pressure canners can vary significantly in many aspects and there are lots of different factors that you need to consider before purchasing one. To help you make a well-informed choice, here are the 3 things that you should always consider when getting a pressure canner. 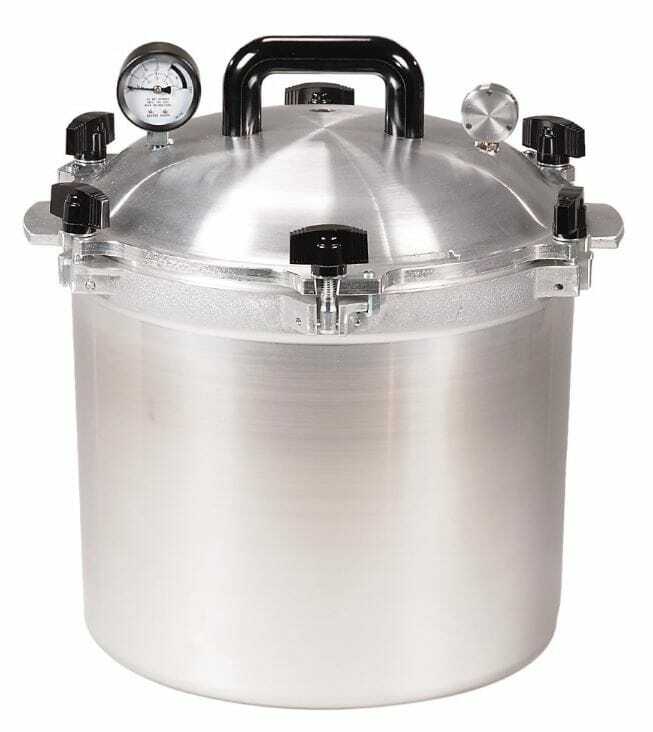 The first most important factor when choosing a pressure canner is size. When you set off to buy one, you should ask yourself how many people are you going to be cooking for. If you’re going to use it for canning food, then this question will be important as well. For those who prefer home canned food, you should always know how many pint-sized or quart-sized jars your pressure-canner can take. And if you are seeking to put a huge amount of jars at once, you might want a canner that has racks so you have many levels to play with. Getting a pressure canner of the wrong size can really ruin the overall cooking experience. Before you buy a canner, make sure it’s big enough for the job. Pressure canners need to have high durability so you won’t need to replace their parts often. For example, a gasket pressure canner might need you to replace the gasket every now and then. However, how frequently you replace it depends on the quality of the product itself, as well as how you’re using it. It’s also worth mentioning that you’ll need to have your gauge checked at least once every 2 years to make sure that it is reading the correct amount PSI. However, this is only limited to dial gauges. If you have a weighted gauge, this is one less thing to worry about. When you set off to get a pressure canner it is important to consider which kind of stove top you have. Heavy ones are a no-no when it comes to glass stove top. The reason is too obvious that it doesn’t really require any kind of explanation. If you have a glass stove top, you’ll need to check to make sure that the pressure canner you are purchasing is compatible and won’t cause any unfortunate incidents. So now that you’re familiar with what to consider when you set off to get your new pressure canner, It’s time to have a look at our list of the best pressure canners in the market. By knowing your needs in advance, the choosing process will be a whole lot easier. All American is well known for its high quality and durability, when you see their products you can easily tell that they are designed with quality and safety of the customer as a top priority, using this pressure canner is nothing less than a pleasure as it is incredibly safe and durable. The massive pot is made with hand-cast aluminum that is as durable as it gets, the satin finish of the pot makes cleaning it the easiest task of all. 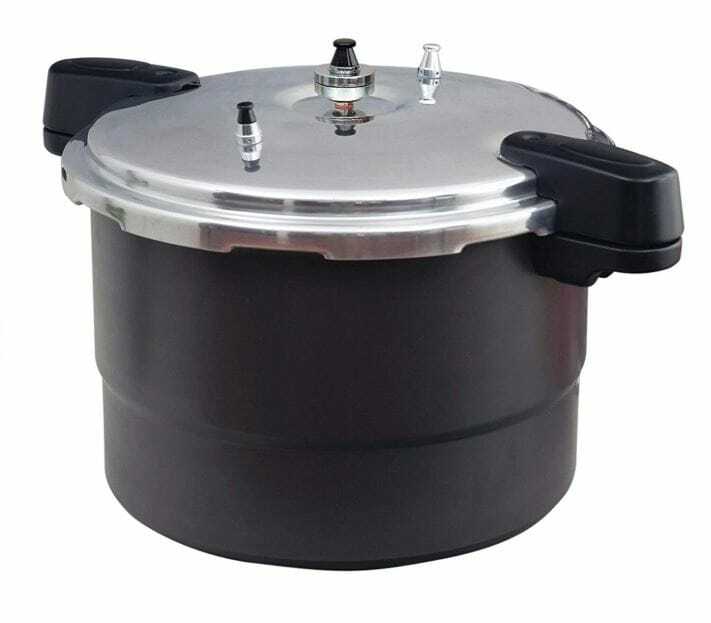 With its massive 21.5 quart capacity this pressure canner can be used to preserve a large quantity of food in a single go, thanks to its easy to use design this task will be done easily and effortlessly. And it doesn’t stop there, not only is this amazing, it also can be used a pressure cooker for your favorite meals, by reducing drastically the amount of time and effort that you put into cooking. Equipped with a steam gauge you won’t have any problem identifying the amount of pressure inside to perfectly match your cooking recipe or your canning needs. You can also choose between 3 pressure settings, 5 ,10 and 15psi. The “metal to metal” sealing system shuts the pot tightly, ensuring that no air escapes. With the metal-to-metal system, you don’t have to worry about gasket repairs. Positive action clamping wing nuts are designed in a way that ensures easy and effortless opening and closing. For extra safety, in case of overpressure the protection system will identify the overpressure and release excess steam. If you’re looking for a pressure canner with excellent safety features, you’ll definitely love what this model has to offer. With a massive capacity of 22 quarts this pressure canner can hold up to 16 pint-size jars or 7 quart-size jars thanks to its two canning racks, which make it suitable if you want to preserve a lot of food in a single go. 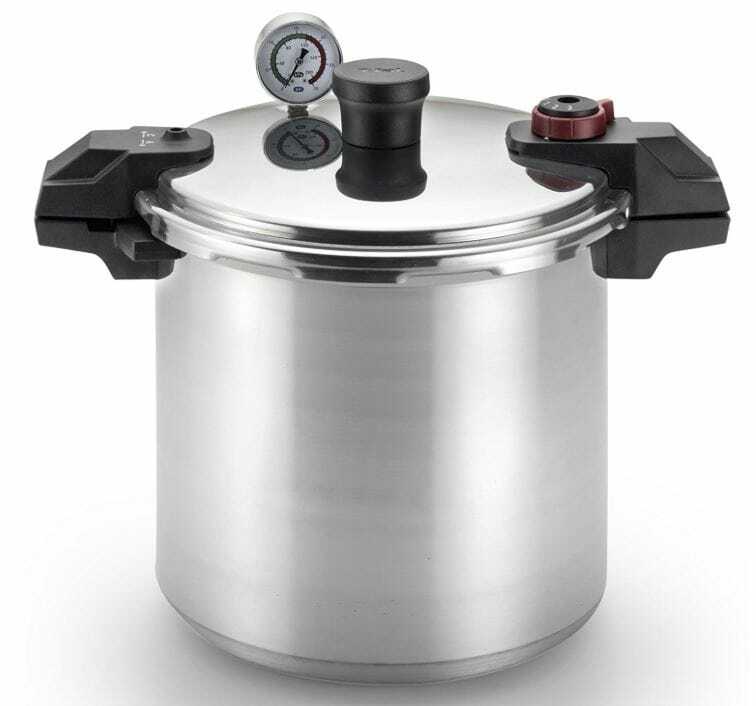 Since different purposes require different pressures, this monster is equipped with pressure control so you can choose between three different settings, 5 psi for cooking vegetables, 10 psi for meat and 15 psi which you will be using for canning. Overall, this pressure canner is well-suited for anything that you could possibly want to do in a kitchen. As for durability, T-fal products are built with safety and durability as a top priority. The heavy gauge construction of this canner scores high on durability and the rustproof aluminum will make it stand the test of time. As for safety, the sure-locking lid system makes sure that once it’s locked it stays that way. With the deluxe pressure gauge dial, you’ll be able to identify the amount inside the pot. And if the pressure ever gets too high in there, it’s designed to release steam until the normal level is restored. In addition to that, the spring safety device makes sure that if the cooker is not securely locked, no pressurization will take place, so don’t worry about this pressure canner exploding anytime soon! If you’re new to cooking and canning in general, you’ll be delighted to know that a receipt book is included with this canner. If you have no idea what you’re doing, this can be very helpful. 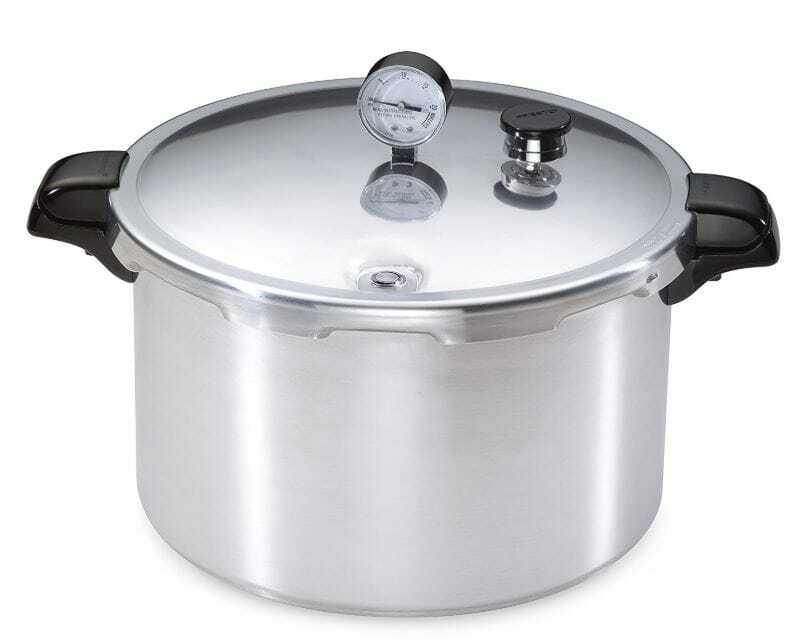 With its 23 quart size this pressure canner and cooker can hold a lot of food if you want to can food, or if you simply want to serve a huge meal for your family. Designed to serve as both a canner that helps preserve fruits, jams, salsa and so on, and as a super-fast pressure cooker than can prepare your delicious meals in a matter of a few minutes, this thing definitely has a massive edge over traditional cookers. The high-quality aluminum of this canner is what makes it capable of lasting a lifetime. To reduce the damage that might happen to this canner due to any unfortunate incidents, it’s designed to be warp-resistant. Contracted with accuracy and preciseness to ensure that the heat will be distributed equally among your food. The pressure dial gauge that sit on top measures accurately the amount of pressure inside the canner and gives you an accurate and correct reading, which is very important. As for the stove top compatibility, this pressure canner can comfortably sit on a regular or even a smooth stove top. With that in mind, being compatible with your stove top is one less thing that you’ll have to worry about. If you’re new to cooking in general and canning in particular, this pressure canner comes with a 76-page book that’s full of instructions and recipes. Even if you’re a newbie, you’ll know how to handle things with this one. . Designed with rust-proof, premium quality aluminum, this pressure canner is built to last. If you’re looking for a pressure canner that you can use to prepare delicious food without having to worry about it being ruined anytime soon, this is a model that won’t fail to impress. 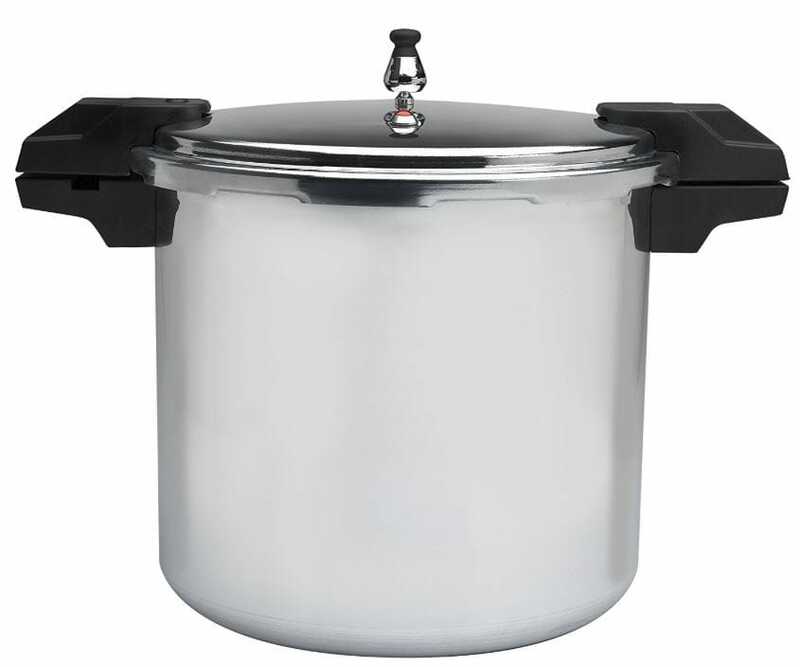 It’s massive 22-quart size make it well-suited to preparing lots of food in one go. It can take up to 7-quart size jars, or 16-pint size jars. If you feel like cooking a huge meal or you just want to can a lot of different things in a single go, this pressure canner is up to the challenge. Its high-quality design assures that it maintains a steady pressure. Whether you want 5 psi for vegetables, 10 for meat or even 15 for canning, it will deliver that pressure with a very steady performance. It doesn’t only act as canner but also as a cooker, significantly reducing cooking time while saving you lots of money and even effort. Thanks to the great amount of pressure that it can handle, you can cook your food super fast. If you want to preserve a lot of food in a single go in this pressure canner, then don’t worry. The racks that come along with it will make sure that you can store jars in it more than one level deep. The overpressure plug on this beast is reusable. For extra safety, the lid of this system is of excellent quality, making sure that once the canner is closed, it stays that way. For extra convenience and for beginners who just need that first push and helping hand, a user guide that includes how to use it along with cooking recipes will come along with this pressure canner. This model is on the smaller size of pressure canners and is the smallest model on our list. Despite its small size, it is still definitely capable. If you’re looking for a pressure canner that combines size and performance, this is definitely it. Designed for small households, this pressure canner’s compact design allows it to fit comfortably in your kitchen, no matter how small it is. As it’s capable of holding 7-pint size jars or 4-quart size jars, this model can definitely prepare a reasonable portion, which makes it very practical and efficient despite its small size. 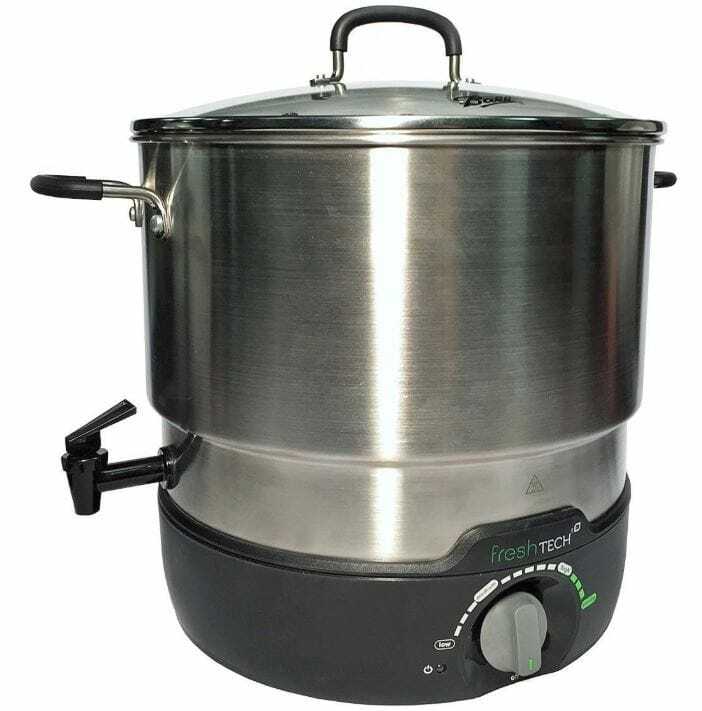 In addition to the canning functionality, this model also works as a cooker, which helps you cook your mean super-fast in a highly efficient way. If you’re looking for a pressure canner that has more to offer than just canning food, you’ll love what this model has to offer. The three-piece pressure regulator allows you to easily alter the pressure inside the pot. If you use just the regulator itself, you get 5 psi, if you decide that you want 10 psi you just add one weight, and if you are looking to can and preserve food at 15 psi, all you have to do is add the remaining weight. simple, easy and efficient. The racks offer extra protection to the jars that you will be using, since they keep from having direct contact with the heat source, they prevent the jars from breaking due to excessive heat. As for the durability of the pot, it’s designed with heavy gauge anodized aluminum that ensures it remains in a good shape for a really long time. 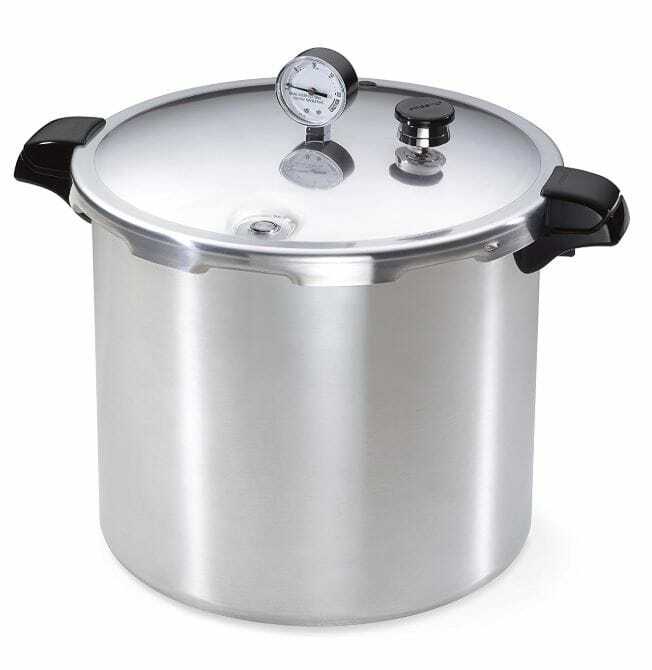 The innovative 21-quart ball pressure canner and cooker can comfortably handle as much as 7 quart sized jars for preserving and canning food with the method that is recommended by the USDA to keep your food fresh and healthy. Equipped with an impressive drain spout that’s designed to drain hot water from the pot, so it would be more functional and easier to move and clean. Let’s face it, a pot full of water can get really heavy. If you don’t need a spout don’t worry, it can be easily removed and if you just want to clean the pot and you need to turn off the spout there is a simple plug on the inside, it’s that simple. In addition to that, the base is detachable designed to make it easier to store and that much easier to clean in general. If you’re looking for a pressure canner that’s easy to store despite its large size, this is a model that you’ll definitely like. Since this amazing pressure canner is an electric one, you won’t have to worry about your stove-top being ruined by its weight. You just plug this canner in and put on any table and you’re good to go. In addition to that, it’s also more energy efficient, allowing you to save as much as 20% more energy over the normal and traditional stovetop pressure canners. The best thing about this pressure canner is it’s mobility, since it doesn’t have to be put on an oven you can plug it in anywhere you want. You can easily put it next to the sink, making it a lot more easier to fill and to clean once you’re done by easily using the drain spout to drain out the water that is inside. On the smaller and more compact end we present this little cooking companion. With a 16 quart capacity, it can easily hold 7-quart jars. Being a pressure canner and also a pressure cooker, you’ll be able to preserve food as well as cook in super-fast speed. This model is constructed with extra durable and super strong, warp-resistant aluminum. Taking the excellent material and build quality into consideration, this is a pressure canner that is designed to last a lifetime and was put together with that as a top priority. Whether you have a regular stove top or a smooth one, it is designed to work perfectly with your smooth or regular stove top. It’ll sit there effortlessly, thanks to its small size without causing any harm to whatever stove-top you have. Equipped with high-quality air vent and cover locks, this pressure canner assures that once it’s locked no air will escape from it, so you will be able to cook food faster and preserve as much food as your heart desires. With its dial gauge that sits in an elegant way on top of it, you’ll be able to read the pressure inside effortlessly to match it to your cooking recipe or canning needs. It also comes with a recipe and instructions book to make sure that you don’t get lost when using it, making it a great choice for professionals and amateurs alike.